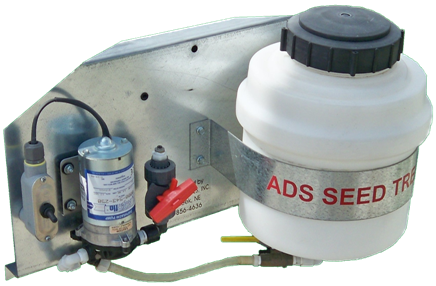 When purchased for use on any of the ADS seed tenders, our Dry or Liquid Seed Treater accurately applies product to the seed as it passes through the auger system. On all ADS Bulk Seed Buggies the treater is operated by the throttle control switch, allowing it to start and stop simultaneously with the auger. If treatment is not required simply turn the applicator off and continue as normal. Powered by a low rpm, high torque gearbox and 12 volt motor. The metering gate and special blade adjusts the flow for various products and application rates. The blade design also helps to eliminate product bridging. A SHURflo 12 volt pump along with a 3.5 gl. 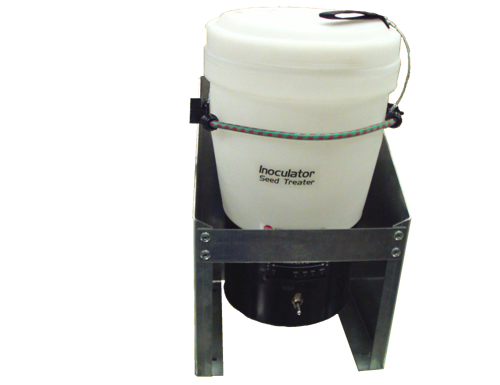 tank are used to transfer product from the treater to the auger tube. George Fisher metering valve provides for a precise control on amount of product being applied.